NATURAL SELECTION occurs when an organism is unable to meet its biological NEEDS, usually a result of change with which organisms try to cope (restore HOMEOSTASIS) by means of a physiological STRESS RESPONSE: in vertebrates, a rapid sympathetic nervous system copes with emergencies and a longer-term response copes with sustained or repeated. The stress response occurs when the organism receives signals indicating that the organism’s stability may be compromised –when its “adaptive scope” (see below) is exceeded. The generalized stress response augments and complements normal –less extreme– relatively localized coping mechanisms and helps the organism compensate for influences or forces that may overwhelm them. There are also internal changes in the precise nature of responses and the competence to react to stressors — rhythms of various hormones and developmental changes across the lifespan — in some respects senescence can be regarded as a disease of stress. Homeostasis describes the dynamic balance of interacting phenomena at (and between) an organism’s levels of organization. It has been applied as an organizing concept of interactions, deeply informing systems biology and applied from intracellular phenomena through the ecosystem(note) (Odum 1971) — wherever multiple processes interact to maintain an general equilibrium. Early / traditional definitions of stress were in medical terms of trauma or dysfunction –probably because those are its most conspicuous –and life threatening– expressions. This is the likely background to an adrenal-based definition, seen occasionally in the literature. It refers to the state of adrenal activation stimulated by the influence or detection of an environmental challenge to the body’s homeostatic mechanisms that cannot be accommodated within the normal metabolic scope of the animal. 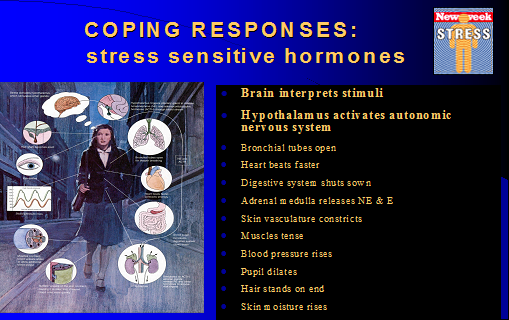 Rooted in the observations of adrenal hypertrophy (due to overactivity) in chronically stressed animals. Adaptive Scope reflects the tolerance of any element of an interacting system to change. The influences on adaptive scope are clearly congenital as well as acquired. The coordinated physiological processes which maintain most of the steady states in the organism are so complex and so peculiar to living beings … that I have suggested a special designation for these states, homeostasis. “The present condition of an organism represents its internal past, current, and future circumstances. That is, states of the organism that enable it to cope with ongoing (and in some circumstances, anticipated) change, and they succeed or fail largely to the extent that they are effective — or at least more so than that of competitive responses — in maintaining short term or long-term stability. EVOLUTION — study of change across generations — the “ultimate cause” of behavior — involves biological variations that affect changes in traits. key words are GENES and MEMES. Questions involve FITNESS (direct or indirect). Another not uncommon misconception in ecology is that there exists a basic ability of systems to always return to equilibrium, a kind of basic and (unfortunately) prevailing idea of ecological “homeostasis” (also known as “the Laplacian demon”) that can be, and has been, challenged on several grounds (cf. Wiman 1991). persistence or probability of extinction is the result.” (Holling 1973, p. 17) Thus, ecological resilience as the ability of a system to return to equilibrium after a disturbance, and the manner in which it would do so, and the several other implications of stability were “condensed” into a new metaphor. In addition, community ecology, and theories of ecological succession (cf., e.g., Odum 1969, Tilman 1999), have introduced partly differing perspectives on stability (and its relationships with spatial scales, and with diversity; see below).